This week’s “app” is both a browser extension and an app, depending on the browser you are using. When I began reviewing browsers, among the things that I hated to lose was my bookmarks. I have a number of bookmarks for helpful tech sites, quick download access, school resources, or things that just interest me. I wanted to be able to quickly move these around among the browsers, if not sync them actively between the browsers I was testing. Xmarks is the premiere service for this. while working as an app for Safari on the Mac. It works amazingly well; just download the extension/app for your browser of choice, create a free account with Xmarks, and tell Xmarks how you want your bookmarks to sync and which ones to sync. Xmarks will even keep folders of bookmarks organized in the same way you have them in your browser. 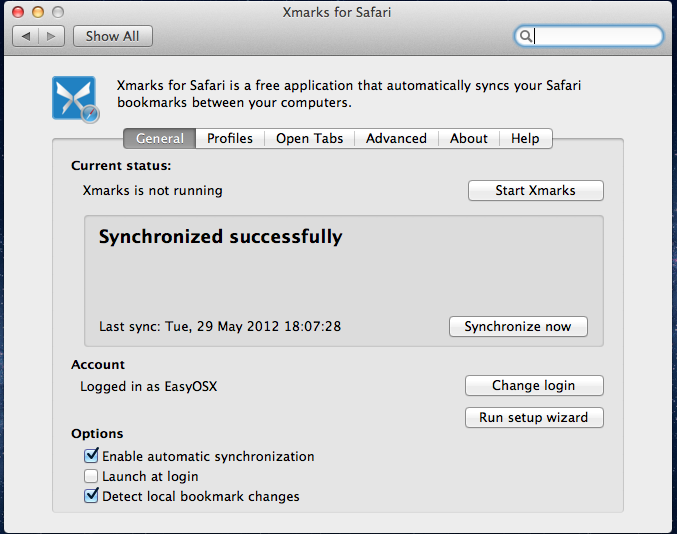 Then if you add or delete a bookmark, Xmarks can automatically sync them to your browsers and devices. But wait? What if you have different bookmarks on different browsers? Aren’t you going to lose them? Xmarks has a plan. When installing the extension into your browser, Xmarks gives you the choice of either erasing all the bookmarks on your browser and add the ones from Xmarks or instead erasing the Xmarks online profile and adding the ones only on your computer. Still not happy? Xmarks still gives you the option to simply add bookmarks from the online library/your local bookmarks to the alternative without erasing any other bookmarks. And if you accidentally delete a bookmark, Xmarks stores 3 months worth of your bookmarks backups to restore from at your leisure. 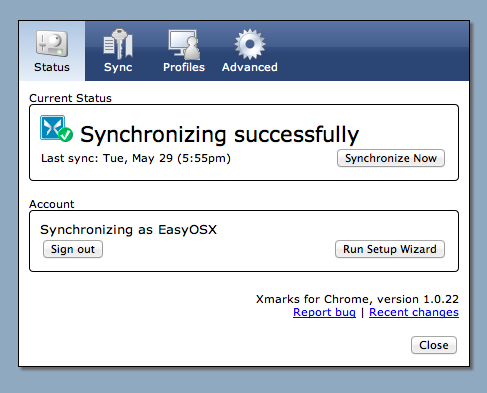 Xmarks also has the ability to sync profiles. This means you can set up certain bookmarks to sync only to certain computers or browsers. So I can sync tech related bookmarks to my office computer from my personal computer without syncing any personal bookmarks. Screenshot of Xmarks for Chrome. System Preferences and allows you to synchronize booksmarks to Safari manually while running in the background. It will not necessarily launch when Safari launches, but can be launched when your Mac starts up. I believe this may be due to a restriction in how Apple allows extensions to run in Safari, so while I would love to see it as a Safari extension I don’t hold it against them for only making it an app. There is also a premium subscription for Xmarks. For $12 a year, you can sync you bookmarks to the Xmarks app on Android, iOS (iPhone and iPad), Windows Phone 7, and Blackberry, as well as any installation of the Dolphin browser. It will also give you premium support and a longer backup and restore period. The coolest premium feature, however, is the ability to sync open tabs between your mobile devices and your desktop browsers, meaning articles you were reading on one device can quickly be read on another. 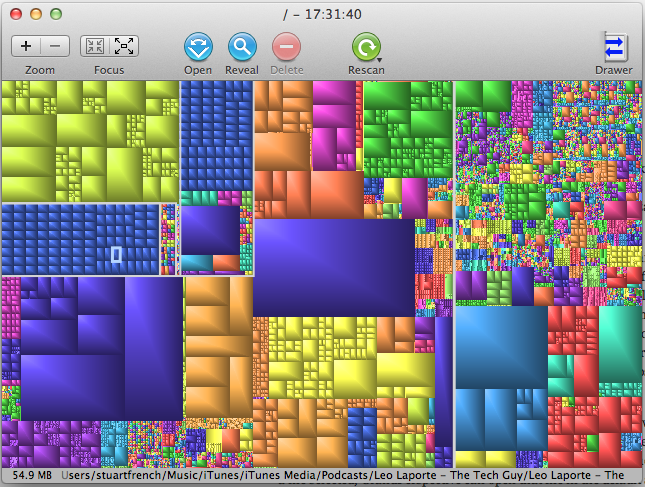 Xmarks only syncs between the big 4 browsers on the desktop, as well as on Blackberry, Android, Windows Phone 7, and iOS. This means alternative and smaller browsers, such as Robin, Opera, and others are left without a direct syncing option. Xmarks does, however, allow users to login to xmarks.com and access their bookmarks from any browser, mobile or desktop. I hope to at least see an extension for Opera, but I am glad that I can still access my bookmarks in a less direct manner. Xmarks is free for the basic services, or $12 a year American for the premium subscription. It works in the Firefox and Chrome browser for Linux, Macs, and Windows, as well as Internet Explorer, and Safari for Mac. iOS, Android, Blackberry, Windows Phone 7, and Dolphin browser apps are available for premium users. You can download it and sign up at xmarks.com. If you have any questions, comments, or suggestions about this or any other topic, leave a comment below or email me at easyosx@live.com You can also check me out on Facebook, Twitter, and YouTube by hitting the buttons on the top of your screen. And check out my Google Plus. Thanks! OS X has a number of settings for messing with what your Mac’s display. You can change the brightness, the quality of the display, invert the colors, and change it to display everything in grayscale (basically black and white). But to navigate to all these settings can take a while, and it would be nice to have a few other features. Nocturne is here to help. you to switch between what is called “Day” and “Night”. Day Mode is the standard Mac look that you already have. But when you switch to Night mode, the screen changes to the settings you have selected in Nocturne. You can switch to an inverted display where black colors become white, red becomes blue, etc. 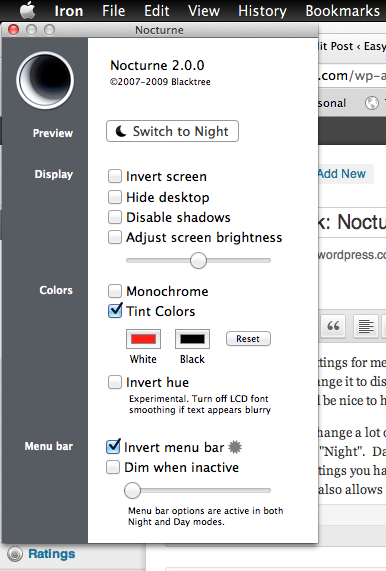 It also allows you adjust the screen to a brighter or dimmer setting and switch to grayscale. But it can do more than that. When switching to Night mode, you can set Nocturne to display everything in a certain tint of colors, such as setting white to display as red. Why is this important? Besides making the screen look as if you were looking through older 3D glasses, color blind users can actually set it up to assist them in discerning colors on screen. However, this feature only allow you to adjust the way black and white appear on screen to be various shades of colors rather than any color changes. This might make it a little harder to adjust the screen to your liking, but it’s a cool feature to have nonetheless. One other feature that’s really cool is the ability to invert the menubar. Instead of having a standard gray menubar, you can change it to a cool black menubar. I don’t know why it is, but I always like the few apps that had a black window; it nicely contrasted with the stoplight (close, minimize and zoom buttons in the top left hand corner). Having the menubar black as well looks pretty cool feature, even if I can’t do the same with the window elements themselves. Since it is inverted, though, selected utilities in the menubar are yellow, rather than blue or white. The drop down menus also remain their standard white/blue palette. 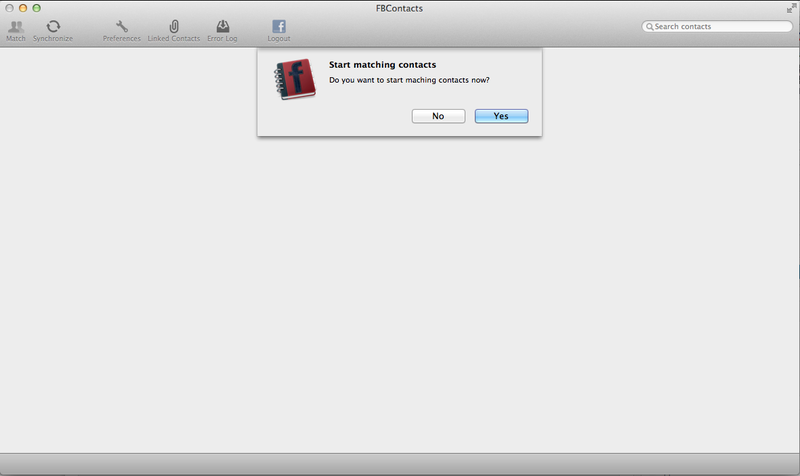 One bug with this feature deals with how Nocturne handles full-screen apps in Lion. In my tests, when I had inverted the menubar and went into a full screen apps, like Pages and Keynote, the place where the menubar normally resides would remain black , even when the menu bar was hidden. I hope to see this bug addresses in future updates. Note how the top of the ads are cut off. or completely opaque. Nocturne allows you to fade out the menubar completely or partially when not using it. Then when you take move you mouse over it, the menubar springs back into full view. While this is a really cool feature, it doesn’t actually provide you any extra screen room, which can be a bit confusing if you’ve completely faded it out and are expecting to drag a window to the top of the screen. I realize this isn’t as much a bug as the fact that the menubar has turned invisible. Overall for anyone who wants more control over the visual tweaking of their Mac, especially when it comes to the visually impaired, Nocturne is a wonderful app to check out. There are still a couple of visual issues that I hope to see tweaked, but overall a pretty nifty app. Nocturne is a free app available from Blacktree.com. The most recent version is available for OS 10.5 and higher, but OS 10.4 (Tiger) users can still download the 1.0.6 version. If you have any questions, comments, or suggestions about this or any other topic, leave a comment below or email me at easyosx@live.com You can also check me out on Facebook, Twitter, and YouTube by hitting the buttons on the top of your screen. You can also check out my Google Plus. Thanks! The more time you spend with an operating system, the more programs you tend to use. On the Mac, this may mean having more icons on your Dock and in your menubar. But by using a lot of background programs, your menubar will get filled up with icons (some of them potentially pointless) and clutter it up. Then if you need to access some of those icons, they can be cut off or hidden because of the program you’re actually in is using the menubar for its own file commands. If you really can’t cut down on the number of menubar programs you need, then Bartender is worth taking a look at. Bartender is a really simple yet wonderful app. It looks at all the programs running in your menubar and allows you to pick the ones you want to display. You can choose to show the icon in the menubar, hide it in Bartender, or hide it completely from view. Then if you need to see or access the icon, just click on the Bartender icon in the menubar, and it will open a tray with all your hidden icons so you can access whatever is needed. The programs will still function if you click/right-click on them, the same way they would if they were still in the menubar. not Bartender will have an icon in the menubar or not. If you choose to have a menubar icon, you not only get to choose from 4 predesigned and very Mac-like icons, you also get the option of choosing a picture of your own as the icon. All it does is miniaturize your selected picture, but it also means that if you’re creative and want to make your own icon, Bartender makes it very easy to do so. So minus one aesthetic touch and a few lacking features, Bartender is a wonderful addition to anyone with a small or cluttered menubar. It is available for Macs running OS 10.6 and higher (Snow Leopard and higher). Currently, Bartender is free while in beta. It will be a paid app once it is out of beta; you can buy it now for $7.50 American or . It is available from Surtee Studios and you can download it at http://www.macbartender.com/. If you have any questions, comments, or suggestions about this or any other topic, leave a comment below or email me at easyosx@live.com You can also check me out on Facebook, Twitter, and YouTube by hitting the buttons on the top of your screen. You can also check out my Google Plus. Thanks!